Grain Handling facilities are built around grain bins and the need to store, dry or move grain from storage to processing to transportation. For moving commercial quantities of grain from bin-to-bin, from bin to dryer, from bin to railcar, or from bin to truck, Skyway Grain Systems custom designs systems to efficiently handle grain based on your operations requirements. Because Skyway is not a manufacturer, they are not tied to specific products when designing a system. Skyway draws from a number of different reputable suppliers to produce a system that is designed specifically to answer to your conditions in terms of capacity, price, and any custom situation you might have created. Skyway used bins from a number of different suppliers to custom design facilities to meet your requirements. Each of theses suppliers manufactures products with unique features that fit into grain handling designs in diverse ways. As with storage bins, Skyway utilizes a number of manufacturers to supply handling equipment. Edwards, Sukup, and Westeel produce drying and aeration equipment available in custom grain handling design. 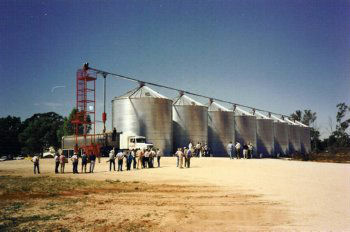 OPI Grain Storage Management and Intragrain provide remote monitoring for moisture and grain temperature in the bin. The Hutchinson Grain Pump is a continuous loop grain conveying system (chain conveyor), that incorporates the functions of many of the traditional grain handling systems. The grain loop can incorporate many storage bin units and provide easy in-load and out-load to trucks or wagons moving grain vertically and horizontally with ease. Lambton Conveyor has been around for 20 years and has become a leader in the grain handling industry. Their Drag Chain Conveyors have been developed with the input of farmers and field tested by their installers to ensure that the product delivers quality service. Lambton round bottom chain conveyors can link all parts of the system, top and bottom, ensuring that grain contamination does not happen from one type of product run to the next type of product run. Lambton equipment allows Skyway customers to put together existing storage and off-line facilities into one completely integrated system. The Lambton Bucket Elevator features a clean computer aided design and 10 to 14 gauge, galvanized construction. The U-trough Conveyor type conveying systems are available in capacities for commercial applications, larger bins and flat storage structures. A practical and economical mechanical drive swing-hopper auger Only Westfield, North America’s leading manufacturer of grain augers – with years of proven field experience – could build such a simple, uncomplicated, efficient and affordable mechanical drive auger. Hutchinson’s Commercial Klean Sweep is an outstanding performer for minimal investment, the best bang for your buck. Heavy gauge components are used throughout to withstand the rigors of high usage. The Klean Sweep bin sweep is available for bin diameters from 24′ to 120’and in 5″, 7″, 9″, 12″ sizes depending upon the bin diameter. There is also a sweep Tractor available for larger bin sizes. Springland U-Trough Bin Unloading Equipment Springland Power Sweep bin unloaders have a U-Trough Design for easy access and ease of maintenance. 11″ U-trough unload systems can accommodate 7.25″ or 9″ flighting. All options are included in the package, no add-ons required.